Life has been busy lately, and we are still settling into a schedule. One thing that has saved us more than once: having a good breakfast prepped in advance! 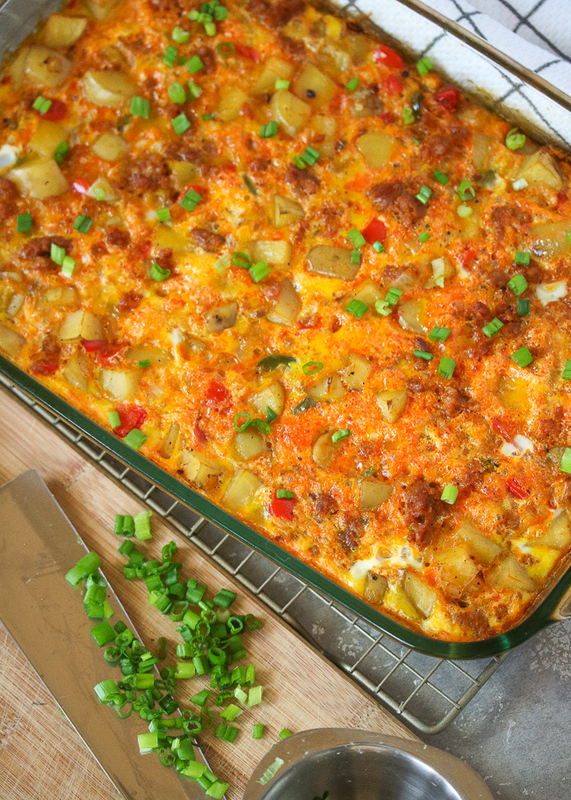 I made this breakfast casserole before having Hudson in December, and froze it wrapped up in individual portions. And let me tell you~ it was so nice to have on hand to quickly heat in the microwave or oven when we were knee deep in caring for our newborn and forgot what day/time it was! I am a big fan of breakfast all hours of the day, but especially breakfast burritos! 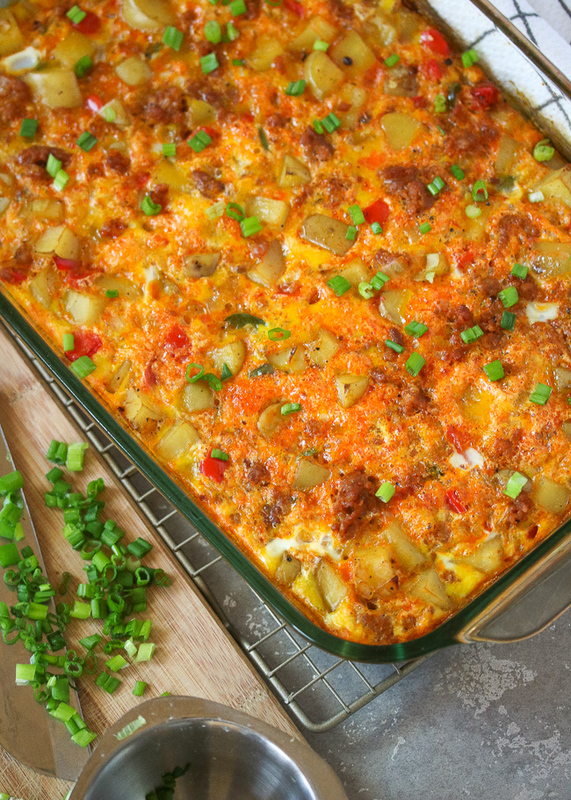 They don't always leave me feeling my best when I go for a typical tortilla, and they can be kind of a pain to make even when I find a grain-free option, so I usually go for something like my usual egg bake instead. 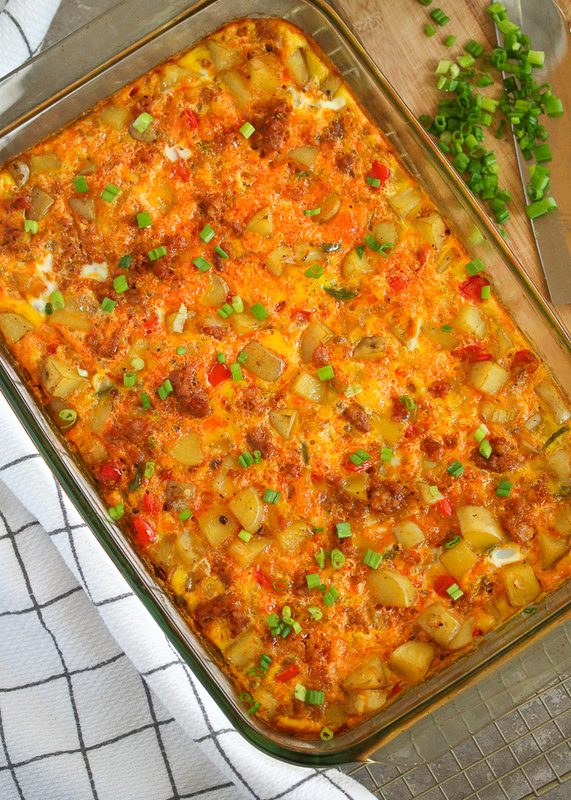 In this recipe, I literally took all of the best parts of a burrito: sausage, potatoes, veggies, and eggs, and stuffed it into a casserole dish instead! 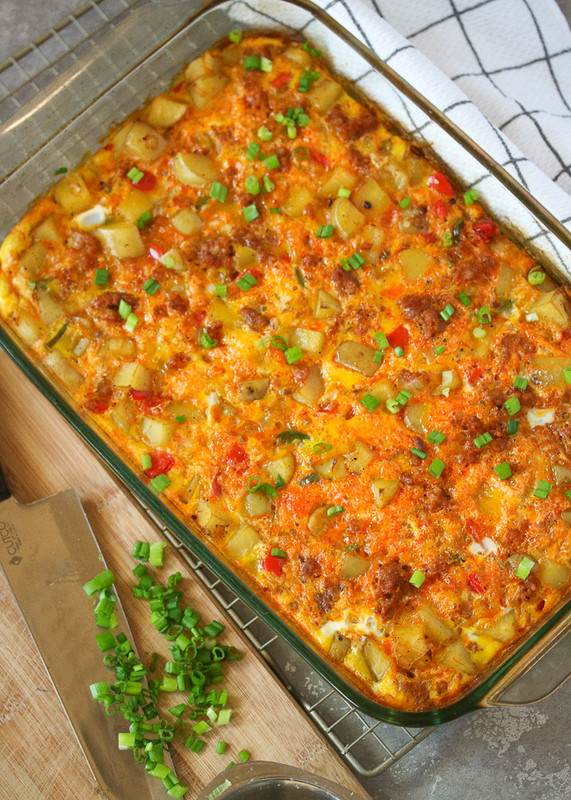 So you get both... the flavors of a chorizo & egg breakfast burrito and the ease of baking it all in one dish. All while being completely grain free and even Whole30 compliant! Speaking of Whole30, chorizo can be a tough one to find. Check out local butchers, or look for the brand "Mulay's". They have a store locator on their website. That's the brand we've had the best luck with finding near us- both at local stores and at Whole Foods! If you can't find a store bought chorizo with ingredients you love, you can totally make your own! There are some really easy recipes out there using just meat & spices. I hope you guys are as excited about this new breakfast recipe as I am! 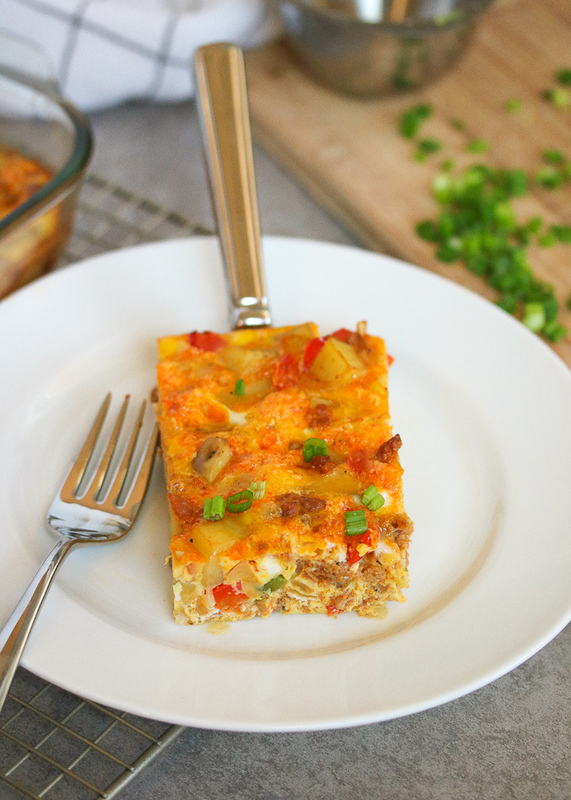 It's so flavorful, super easy, and awesome for busy mornings! Preheat the oven to 350ºF. Grease a 9 x 13" baking dish with avocado oil, or use parchment paper to line it so the eggs don't stick. Cook the chorizo in a large skillet over medium heat until browned and broken into crumbles. Add it to the greased baking dish. In the same skillet, turn up the heat to medium high and add the potatoes, jalapeño, bell pepper, and onion. Sauté until potatoes are fork tender and lightly browned, about 7-8 minutes. Add to the baking dish and mix with the chorizo. In a large bowl, whisk the 12 eggs with coconut milk and spices. Pour over the meat and veggies. Transfer the dish to the oven and bake for 30 to 35 minutes or until golden on top and eggs are set. Slice into 8 squares and serve! My favorite brand for Whole30 compliant chorizo is "Mulay's". Check out their website for a store locator! I find it locally in the East Bay at Draeger's Market, or at Whole Foods. 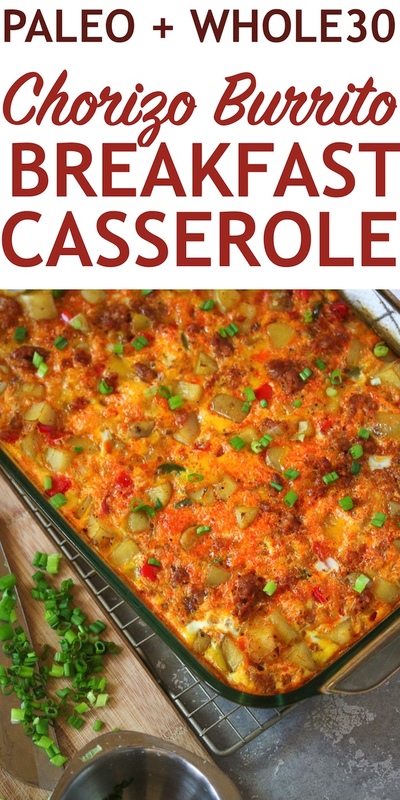 Making this low carb or keto friendly? Omit the potatoes, it will still be so delicious and protein-packed.